Multiple views books are by definition a mixed bag. The hermeneutical issues addressed in this book are significant, but in each of the main contributors' essays, they focused on different things and therefore talked past each other a bit. There were strengths and weaknesses with each of the main views: Kaiser's principlizing is intuitive and solid, though it tends to flatten genre, is limited to ethics, and turns intepretation into a quest to find the proposition in each passage (biblical interp is at least this, but it is much more). Doriani's redemptive historical model is closer to where I am at (with much influence from Vanhoozer). He offered some helpful hints in relating the hermeneutical task to growing in Christlikeness, and therefore, wisdom. But his essay was short on actual hermeneutical tools. Vanhoozer's essay (his drama-of-redemption model) was inspiring and helpful, but even less helpful in offering something concrete. I continue to be unsupportive of Webb's proposal as a hermeneutical model. It ironically disregards the critical shifts in redemptive history (that is, where he observes changes in the biblical teaching and finds an ongoing trajectory over time, I suspect that those changes are due largely to the seismic shifts due to God's actions in redemptive history). His model has no regard whatsoever for literary genre, and I am not sure how we are supposed to take a proposal seriously as a hermeneutical model which does not account for genre in the least. The most valuable part of the book were the responses to each of the essays, by the both the main contributors and by guest essayists Wright, Strauss, and Wolters. Those responses make the book worth reading. These four essays give short summaries of a variety of hermeneutical options in the evangelical world. While two of the concluding reflections are worthwhile, I don't think this book really helps one to "move beyond the Bible" or interpret it. I've read a number of the authors books and they are better than this volume. My takeaway is that evangelicals, a tribe I consider myself a part of, need to get better at hermeneutics, interpretation, and the great tradition. Excellent read. This book provides a balanced, if challenging series of views on how to move beyond simply reading the bible towards applying it to challenging issues of today.My only disappointment is that the various essays do not address the same issues. Had the authors all tacked the same issues, walking us through their hermeneutical models, the reader would have been better able to compare them. This is one of the better books I have read in the Counterpoints series. Each of the four main contributors present their cases well and give substantive feedback and criticism to each other in their responses. Additionally, the inclusion of reflections by Strauss, Wolters, and Wright are an excellent addition to provide further reflection from various perspectives that are not "defending their own view". The most significant weakness of the book as a whole is stated by Wolters when he points out that at least four distinct categories of moving beyond the Bible to theology are presented by the contributors, but not every author addresses every category. In fact, he shows how Webb deals exclusively in category 2 (ethically troubling injunctions), Vanhoozer alone deals in category 3 (forging theological categories), and Doriani is the only one to deal in category 4 (reception history of a theme). Consequently we get only 3 voices in categories 1 and 2 and only one voice in categories 3 and 4. This leaves the dialogue tangentially related and overlapping, but rarely exactly on the same page. It would be a better approach for the series editors to assign one issue in each category so that each contributor deals with the same issues. Addressing the same issues would help in demonstrating the unique differences of the various approaches. Nevertheless, the book is thought-provoking and helpful. The average Christian may not think that books like this are very important but contrary to what most think; they are very important. This book deals with the subject of hermeneutics. Even that sounds foreboding to many but hermeneutics is the way we interpret; in this case, the Bible. How we interpret the Bible impacts the way we live and the way we live impacts our world.It is a four view book and it starts right where most of us start when we first become Christians. This is what I would call the default position. We know we should read and study the Bible and when we become saved we begin to really want to and the first thing we do is look for principles to live by. This approach is represented by Walter Kaiser, a well respected Biblical scholar that at one point headed the seminary that I attended; Gordon Conwell. This approach is called the Principalizing Model(PM).The other views are: A Redemptive Historical Model, A Drama of Redemption Model, and A Redemptive Movement Model.Frankly, this book gets better and better as it goes along. The third view; A Drama of Redemption Model(DOR)by Kevin Vanhoozer was the best read so far until I got to the Redemptive Movement (RM) by William Webb! Now I feel like I'm moving beyond myself and really learning to be a better interpreter of God's Holy Word! This resource is very helpful and extremely prevalent today with the rise of Biblical Theology and resources on the topic. It is crucial to understand how we interpret the Scriptures and "move beyond" them to practical theology and doctrinal theology. This book gives plenty of argumentation and help in understanding several views of how theologians have done this. The reflections in the back are also very helpful.This is a great resource to start with then you are considering which hermeneutic you hold to. I will say that you may end up adopting a variation of a few of them, or even see value with all of them and form your own view. I read this book amongst friends in a book discussion which was incredibly helpful as we all were able to discuss and work through confusing matters. I would recommend this highly.This is a great book and it will definitely help you in your hermeneutical study. As conservative evangelicals who uphold and believe in the inerrancy and sufficiency of scripture, many problems have risen in the arena of 21st century life. Have you ever wondered what to do in situations not explicitly panned out or addressed in the Biblical text? Things like Transexual church members, Polygamy, Slavery, Abortion, "pulling the plug" ethics etc... This is a wonderful compendium of 4 hermeneutical approaches to these problems. Though each system is flawed in some way, they are equally helpful in other ways. This book will help the church read their Bibles more fervently, not "move beyond" it. I recommend this book for all christians who uphold scriptures sufficiency and are involved in their local church. Overall a helpful introduction to the hermeneutical milieu in the academy today. I'll offer my thoughts on each essay. Kaiser: Good, but doesn't move beyond the bible in any way. Principalizing seems in danger of belittling the text. Doriani: Good, but missing something. Still not sure how far beyond the bible he moves. Vanhoozer: as always, my favorite. We act out the drama of Scripture today. Great stuff. Webb: hard to nail down. My least favorite. Seems really full of himself. The final reflections from Strauss, Wolters, and Wright seemed a bit superfluous. I'm also realizing I'm not a fan of the response essays in multiple views books. Overall, a good read. Worth reading if only for Vanhoozer's essay. As always, these multiple views books can be a bit disjointed, especially when the editors fail to ensure that all the contributors are the same page (which they often do; come on, editors!). This book is probably a little guilty of some of that, because, as Al Wolters demonstrates on his essay, the contributors seem to mean different things by "moving beyond the Bible." Thus, at times, the work is less of a presentation on competing views--although there is certainly some of that--and more of a collection of generally complementary essays addressing a range of related issues.Overall, though, I felt like this book was one of the better multiple views books I've read. The essays were overall well written, provocative, and stimulating. Like all the Four Views books I have read, this is a helpful resource for comparing various views on a particular subject. Unlike books where you hear about views, you hear the views from people who genuinely believe them.The subject of moving beyond the Bible to theology is an important one. How does one interpret and apply the entire canon of the Bible to their lives today? Rather we realize it or not we have a framework for applying scriptures to our lives. As one of the authors points out, every time we do not greet one another with a holy kiss, we are moving beyond the Bible to theology.I commend this resource to anyone thinking about how to apply scripture. A fantastic book! I have been struggling through how to to go about studying the Bible and what sort of hermeneutics to use. This book was quite helpful in giving me four great approaches to interpreting Scripture. While I am still not sure which approach I would use, I appreciate these 4 approaches, especially the critiques of each approach which allowed me to see the strengths and weaknesses of each.I am especially grateful for the additional reflections at the end by different authors who further discussed the approaches and their own ideas. Like Christopher Wright, I probably see myself using a blend of the four approaches since each is useful for different texts. As with any of these "four views" books, the essays are somewhat uneven. This was especially so in this book, since it did seem like each contributor was coming at the question from different angles (ie. only Vanhoozer's essay addressed how the Bible contributes to doctrinal questions, most others focused on ethics, and Webb's essay focused not so much on how we meet contemporary ethical challenges as how do we interpret texts in the Bible that we as contemporary readers find ethically challenging). The book is most valuable in terms of the contributors' responses to each other, and the three other responses at the end. 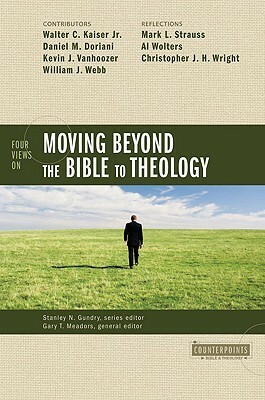 The book presents four approaches to going "beyond the Bible" by four different authors. After each approach the other authors provide a critique and their own interpretations. Finally, three other authors provide their own interpretations and a synthesis of all four approaches. I enjoyed this book as it was intellectually-challenged (although not for the faint-hearted). Each approach appears (to me) complementary and, as with everything, approaches are dependent on the reason for going "beyond the Bible". I am less and less inclined towards these books anymore. Doriani's contributions were good and Vanhoozer was compelling at times, but it turned into a situational ethic debate, rather than a theological method. It may be worth your time to skim, but I would suggest that you read a thorough review of the book instead of the book itself - Tom Schreiner is writing one to come out in the Spring SBTS Journal 2010. I'm not a big fan of the four views format. It doesn't seem like any of the authors get adequate time to present their views completely. That being said, I was able to take away several points from each author about the best way to stay faithful to scripture while facing situations not explicitly addressed in scripture. This book is not so much forward looking as archival. In that respect it fits well with those other books which discuss four or five "approaches to..." It shows clearly what have been, and what are the key differences between the predominant approaches within Evangelicalism on this question over the last century or so. This was a very good book. Not because of the counter point format - that was a distraction - but because of the contributions... Every author had something good and helpful to contribute... some more than others of course, but overall I found something helpful from each one. A rare treat in an otherwise very poor series. Some good stuff here, though the title is deceiving, and it might have been helpful to have all contributors apply their paradigm to the same case studies.Vanhoozer's stuff is worth the price of the book alone. Wolters and Wright are also valuable to read. It was an interesting reading with real important topics which led me to a good reflection. The cases of slavery and transexuality are profound and requires from us more sympathy. I did not like the title of the book, gives an impression of living beyond the Sola Scriptura. Pretty abstract topic, but helpful to recognize that the shifts from one discipline to another are not always seemless. We often smuggle a lot of presuppositions in.